The Department of Housing and Urban Development on Tuesday shook the reverse mortgage world with new rules regarding mortgage insurance premiums and principal limits. While the industry continues to sort out the exact effects — many of which may not be known until after the first months of endorsement data come in after implementation on October 2 — here’s what we do know so far. The expected rate “floor” at 5.06% has collapsed, with every one-eighth of a percent difference in expected rate influencing the principal limit all the way down to 3%. This will likely require lenders to lower their margins in order to achieve higher principal limits, according to Dan Hultquist, director of learning and development at ReverseVision. At current rates, principal limits will run about 20% lower for borrowers between the ages of 62 and 80, according to an analysis by Jerry Wagner of Ibis Software Corporation. While factors flattened out for borrowers at age 90, this plateau does not occur until age 97, Wagner said. For instance, at age 62 and a 5% rate, a 62-year-old borrower would have a principal limit factor of 52.4% under the old system, and 41.0% under the new system. That’s a drop of 11.4 percentage points, but a 21.8% reduction in actual principal availability, Hultquist observed. The so-called “ruthless” option had been floated in recent years as a way for higher-income individuals to use Home Equity Conversion Mortgages to their advantage: Take out a reverse mortgage line of credit on a high-value house, let it grow over time, then cash out once the line is worth more than the property itself. But these rule changes have reduced the incentive for this strategy, Hultquist said. HUD officials indicated that these rule changes were, in part, designed to make it more difficult for borrowers to cultivate credit lines worth more than their homes by prolonging the balance growth. Though HUD cited concerns about the MMI Fund — which has bled almost $12 billion since 2009 because of reverse mortgages, according to HUD — the officials also framed the slower growth as beneficial for the borrower, helping them to preserve more equity. Even with these restrictions, HUD doesn’t expect to actually reverse the damage already done to the MMI Fund; these changes will only stanch the bleeding, officials said, and were merely intended to reach a more stable financial base for loans moving forward. 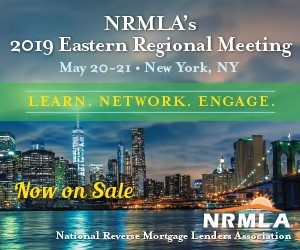 These new rules will not affect any borrower that already has a reverse mortgage, HUD officials stressed, adding that they did not want to cause any additional anxiety or confusion for existing HECM borrowers. But on the flip side, with a little more than a month until the new rules take effect, originators are already bracing for a rush of borrowers who want to complete their applications in time to lock in the higher limits and potentially lower insurance premiums. “First and foremost, it means that if your client, friend, or family member is looking into a reverse mortgage, now is the time to consider moving forward,” Laurie MacNaughton, a reverse mortgage consultant with Atlantic Coast Mortgage, wrote in an e-mailed blog post.